Feeling the need to show off your scratch skills? 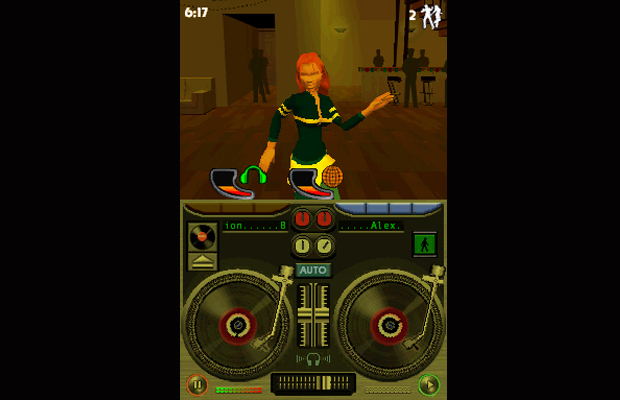 DJ Star, the recently announced DS rhythm title from Deep Silver, may give you the opportunity. Starting you off as a rookie DJ and forcing you to hone your skills to the beat of 40 popular songs, you can eventually find yourself spinning in prestigious cities such as London and France. There's also word of a creation studio, which will allow users to create their own songs and trade them with friends using the DS wireless connection. The game's been announced for Europe and Australia so far and comes out later this year, but there's no word if it will make it to US shores. I feel like the tracklist could make or break a game like this, and since we have no word on any of the songs yet, I can't really comment, but I like the general idea. After all, I played the hell out of that turntable level in Rhythm Tengoku Gold, so if this is anywhere near that good I'm sure to become addicted. SCRATCHO! Deep Silver, the games label of Koch Media, a leading producer and distributor of digital entertainment products, and the French developer Game Life today announced DJ Star for Nintendo DS™ for Europe and Australia. The DJ game for Nintendo's handheld console will be released later this year. Scratch in real time in DJ Star, using the Nintendo DS Touch Screen! This innovative title includes several real DJ features, 40 famous tracks (Electro, R&B, etc. ), as well as a number of mini games. DJ Star offers an excellent quality of sound and is easy to learn, even for players who have never seen a turntable before. A step-by-step introduction and the easy-to-use user interface ensure that fans will quickly learn how to mix and create songs. So players can even make their own tunes in the "creation studio” and save them on the biggest Nintendo Game Card available at the moment. Moreover, players can swap their favorite creations with their friends through DS Wireless Communications. Game Life is a dynamic independent videogame publisher, willing to release games with original concept, that are simply easy and fun to play. With its quality content and worldwide IP, Game Life teams are focusing their activities on next generation console games, working hard to offer the best gaming experience to the end users.